Reuse is for everyone! Smart, savvy shoppers find they can often find what they want and need second hand, and be thrifty and green at the same time. Remember if you can’t reduce - then choose to reuse! Halloween isn’t just orange and black - it just went green! Swap it. Did you know that if you were to swap the costumes of only half of the children who celebrate Halloween you would reduce annual landfill waste by 6,250 tons, equivalent to the weight of 2500 midsize cars. And that doesn't even address adult costumes. 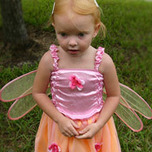 By swapping costumes, kids get new-to-them costumes, and parents save money and the planet by reusing. The National Costume Swap Day website offers ideas for how to organize a local kids’ costume swap in your community. Shop thrift stores. If you don’t have a costume to swap try visiting one of your local reuse stores for great Halloween costumes that are unique, inexpensive and creative. For example, Arc‘s Value Village has a Halloween BOO-tique from September 23 to October 31. They even offer costume ideas at on their website. Make your own costume. Raid your closet and unleash your creativity. (Grandma and grandpa's or a friend's closet works just as well). Or if you're looking for a fun and creative activity to do with your child visit ArtStart in St. Paul. Staff from their ArtScraps program will get you started on a fun and unusual Halloween costume so you can create a new costume out of donated art materials. Rent a costume. CostumeRentals - a combined project of the Guthrie Theater and The Children's Theatre Company - offers a truly unique collection of over 30,000 theatrical costumes. Costumes are available for public use year-round and can be rented by individuals, business, and organizations for use locally, or to be shipped anywhere in the world. Reduced rates are available to schools, theaters, and nonprofit organizations. Use non-toxic face pencils to draw on your child’s face. Consider handing out recycled-content pencils instead of candy. Use a pillow case or reusable bag to collect your trick-or-treat goodies. Limit your decorations to a few, long-lasting favorites. Find a pumpkin for carving or eating using the Minnesota Grown Directory. Compost your pumpkins after Halloween. Shopping reused gets you great stuff at great prices. It's easy on the environment too. Hennepin County encourages residents to Choose to Reuse by partnering with 80 retailers to offer great deals on used and rental items. Every year in Hennepin County, 32 million pounds of usable clothing and household goods are thrown away. Choose to Reuse encourages residents to reuse and help reduce the volume of waste thrown away. Download Hennepin County's free coupon book for local retailers. Coupons are valid October 1 through November 30. For additional tips and reuse ideas ‘Like’ them on Facebook. Give and get items by using the Twin Cities Free Market. The Free Market program is a web-based residential exchange program that specifically targets the exchange of reusable and durable household goods. As of 2010, the Free Market has grown to include over 150,000 participants and has facilitated more than 100,000 exchanges. Over 11.4 million pounds of reusable goods have been saved from landfills and incinerators! If you have a favorite reuse or repair shop or are part of a reuse organization, connect that shop with the newly launched Minnesota chapter of the Reuse Alliance. The goal of the Reuse Alliance- Minnesota Chapter is to bring together reuse organizations, environmental advocates, and resource recovery experts to discuss ways to conserve resources through reuse in Minnesota, provide community outreach about reuse organizations, and determine best practices for the MN reuse community to connect. The Reuse Alliance Minnesota Chapter is also embarking on a project called “Measure Your Treasure” to create a voluntary method for reuse and repair businesses to measure and report their environmental, social and economic good deeds. To connect with the Reuse Alliance Minnesota contact Arielle Courtney at Arielle@reusealliance.org. Dig deeper in to reuse options by watching a live webinar called New to You. This webinar explores how consumers can get the most useful life out of existing products and how some products can be repurposed to keep them out of the waste stream even longer. In addition to an overview on reuse, specific topics will include building material reuse, creative reuse, and online reuse marketplaces, October 20, 1-2:45 p.m. Trees and shrubs are an investment in your home and can help you save energy or manage storm water. You can learn to prepare trees and shrubs for winter at Maplewood Nature Center, October 22, 10 a.m.-12:15 p.m. Develop your understanding of sustainability by learning about sustainability research and policy at the Twin Cities Urban Sustainability Forum, November 2-3, University of MN Continuing Education Center (St. Paul). The 2011 Do it Green! Minnesota Green Gifts Fair provides green gift options and low impact ideas to celebrate the holidays from Thanksgiving to New Year's and everything in between, November 19, Midtown Global Market (Minneapolis).